NMZ/NMZV pump is single stage, axial split case, double suction, between bearing centrifugal pump. It’s suitable for pumping clean water or slightly contaminated water or liquids which are physically and chemically similar to water, where large quantity and certain head are required. The casing is axially split into two parts. The upper part (lighter) and lower part of the casing differ in weight. The inline suction and discharge nozzles are cast in the lower half casing. This design makes it’s easy to remove the upper casing and rotary components without disturbing the motor and the pipework. The closed double suction impeller can lower the NPSHr due to each impeller eye only handles half of the total pump flow rate. And it also can increase the efficiency through back-to-back / double suction impeller design, as the power is not lost to balance the hydraulic thrust. The bearings are located on both sides of the rotor, which reduces the deflection of the shaft and make the pump runs more stable. 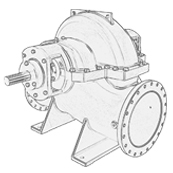 Pumps generating high heads have dual volutes to reduce radial forces, ensuring minimal shaft deflection and low bearing loads. And it’s with a wide installation versatility, the pump can be produced in horizontal or vertical mounting, clockwise or anti-clockwise rotation, side suction or bottom section.